For the river Willkamayu in the Ayacucho Region, Peru, see Willkamayu. The Urubamba River or Vilcamayo River (possibly from Quechua Willkamayu, for "sacred river") is a river in Peru. Upstream it is called Vilcanota River (possibly from Aymara Willkanuta, for "house of the sun"). Within the La Convención Province the naming changes to Urubamba. A partially navigable headwater of the Amazon River, it rises in the Andes to the southeast of Cuzco. It originates on the slopes of Khunurana in the Puno Region, Melgar Province, near the La Raya pass. It flows north-north-west for 724 kilometers before coalescing with the Tambo River to form the Ucayali River. John Walter Gregory, the British geologist, drowned in the river on June 2, 1932 while on a geological expedition to the Andes. The Urubamba is divided into Upper Urubamba and Lower Urubamba, the dividing feature being the Pongo de Mainique, an infamous whitewater canyon. 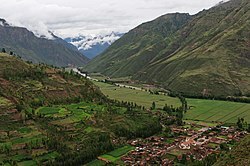 The Upper Urubamba (Alto Urubamba) valley features a high population and extensive irrigation works. A number of ruins of the Inca Empire lie in the Sacred Valley, including the Incan city of Machu Picchu, Patallaqta, Pikillaqta and Raqch'i. The Salcca-Pucara hydroelectric project is associated with the river as well. The lower Urubamba River was mapped for the first time in 1934 by Edward Kellog Strong III. He and two friends from Palo Alto, California, Art Post and Gain Allan John, navigated the river with its ferocious rapids by canoe and balsa rafts provided by the indigenous people. The mapping was done at the request of the Peruvian military when they heard of the expedition planned by the three 18-year-olds. It was turned over to the military when the boys arrived in Iquitos. It was the only map of the river until it was mapped by satellite many years later. The names and places on the latest map came from the original map drawn by Edward Strong. Wikimedia Commons has media related to Urubamba River. ^ "MINISTERIO DE TRABAJO DESTINARA S/.5.6 MILLONES PARA LA CAPACITACION DE JOVENES EN LA REGION CUSCO". Ministerio de Trabajo y Promoción del Empleo. Retrieved June 7, 2014. Willkanuta - Adoratorio muy célebre entre Sicuana y Chungara. Significa casa del Sol, según los indios bárbaros. Willka - Adoratorio dedicado al Sol u otros ídolos. / El Sol como antiguamente decían y ahora dicen inti. Uta - Nombre. Casa cubierta. ^ Salcedo, José Víctor (9 December 2011). "Persiste el rechazo a la hidroeléctrica Salcca Pucara en las comunidades campesinas de Canchis". La República (in Spanish). Cusco. Retrieved 27 November 2018.